Some specific finish carpentry hand tools are needed To get your trim work projects going. I will start with the most basic carpentry hand tools, some of which you probably have stored around the house. First a tool belt would save you a lot time from misplacing these smaller tools while you are working. I definitely recommend one. Next of course is a pencil, not a pen as ink is harder to remove then pencil and the ink often times will bleed through the paint. A flat carpenter pencil works the best as it is more durable than a regular round pencil. You will also need a tape measure just be sure it is readable and in fairly good working order. The one I use and prefer is the basic 25' stanley. They are reasonably priced and durable and have served me well. I don't recommend the fat max as they are nice but hard to get in and out of your tool belt. The extra length is nice also for the longer baseboard runs. For new more advanced measuring tools check out Laser Measuring Tools. Tools for carpentry will include, what I call a speed square. A speed square is a small triangle shaped square which you can carry in your tool belt. This is a handy tool to have around for other projects as well. As you probably have or will notice some of these tools for carpentry I am referring too have a lot of other uses in other trades and projects. Next is a small hammer also to sink the stubborn nail heads, a nail set or punch a sharp utility knife also a small 7" wonder bar or pry bar and a 7" end cutter. I call these my nippers. A stud finder is nice and fairly cheap when compared to saving you time on the job. A few other items include a smaller sharp wood chisel, nice to have a small set of these, also an 8" torpedo level and an 8 oz bottle of wood glue. Again all of these tools I wear in my tool belt, a big time saver. Some other tools and items necessary for your trim work are a good 4'level. I use the wood ones and recommend them. I have seen to many people get into trouble with any other kind. My advice as a trim carpenter is to buy a new wood one and cherish it. In other words take good care of it so you know you can trust it and if you do buy one spend the extra little money to buy a level case. This can be a handy tool in a lot of other projects. Safety is also very important as trim work can be a little dangerous if the tools aren't used properly this brings me to safety glasses. I have grown accustomed to wearing safety glasses while performing certain tasks. I highly recommend them when using the miter saw or when shooting the nail guns. This comes from painful personal experience. Last but not least and not necessarily in the family of carpentry hand tools we come to knee pads. Some good advice to you is to wear them. My knees are shot because I didn't and now I have to wear them all the time because of the pain. I urge you to check out the knee pads, safety glasses and all the other tools here, because if these finish carpentry hand tools work for me being in business, they will work for you. For a little more advice on safety click hand tool safety. Believe it or not most of the hand tools for carpentry were already invented and in use by the 15th century. 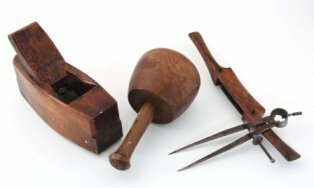 These hand tools were very much the same as the modern carpenter of today uses. These hand tools of course have evolved and are much easier and safer to use but the same concept for each individual hand tool is the same. 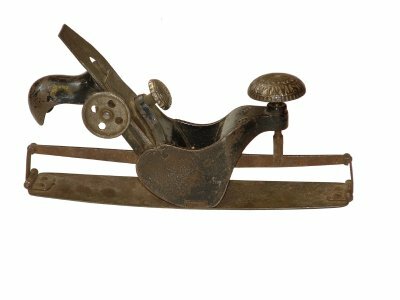 Even back then these tools were a little primitive but were made to do a job and were often times made of high quality because of this. The bad thing about these hand tools of today is; the wide variety of quality. The cheap knock offs of the quality hand tools are sometime hard to distinguish and you can end up with a lot of frustration if you don't know the difference. Even with these cheap hand tools it is a good idea to do some research and know what your buying. After all whether you are waiting for an order to replace the cheap knock off or making two trips to the store, time is of the essence and buying the same tool twice really is frustrating. The bad thing about it is, it has happened to the majority of us at one time or another. 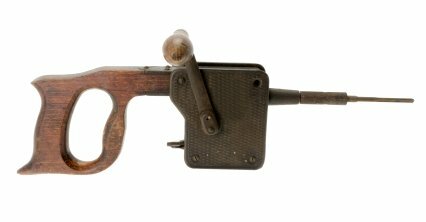 Some of these old hand tools from yesteryear can still be found at a few websites on the internet that specialize in antique tools and carry a good variety of these old hand tools. The thing about that is lot of times these people know what they have and want premium prices for these tools. 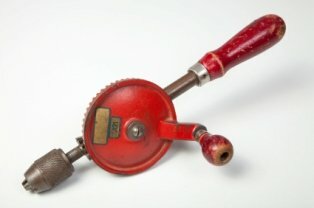 Auctions are another place where you might score on some old antique tools. A lot of times these old farmers have them lying around and don't have a clue what their for, especially the old carpentry hand tools. Some of these old carpentry hand tools can also still be found at various antique stores off the beaten paths around the country. If you keep your eyes's open and know a little about these hand tools you can still land some pretty sweet deals. Not only that but the quality of these tools are so that they can often still be used and work perfectly. That alone tells you a little about the quality of these old hand tools. Not being a collector of these old tools I do however find it extremely interesting learning about the individual tools and how they were used. The ingenuity it took to make and use these tools way back when was absolutely tremendous. Return From Carpentry Hand Tools page to Home - Finishcarpentryhelp.com.